Ashtar - "Planet Earth is Ready for Truth and Peace! --- Ashtar On The Road Teleconference - September 10, 2013. "And when I say 'we,' it is because we are joined with you, because you have asked us to come and fulfill our Mission which is to assist you, Beloved Ones, in coming into your own Divine realizations of Who You Really Are, and to make your Ascensions, which you promised to yourselves that you would do long ago and far away! "But first we have much to do. It has been only that we have been waiting for you to stand tall and raise your voices! Not that this group has not been doing so. We assure you we know Who You Are and we know that your Hearts and your minds have been together in this - some of you for all of your lifetimes upon this Planet - and lifetimes before this, to be sure. Some of you more recently have wakened up - it makes no difference - you are here! That’s what matters, that’s what counts, and you are joined by sufficient numbers of Humanity that you have prevailed!!! "Whether you have judged yourself or whether you have pronounced judgment upon some or all of Humanity - this must be cleared!!! Beloved Jeshua/Sananda says that Forgiveness is the absence of judgment. ** So we can say to you that it must all be forgiven! "But what is really going to bring it home, particularly to the in-between generations - they may be Indigos but they’re not Crystals and they aren’t all-knowing and they don’t have all of the information. You have it because you’ve opened up your wisdom eyes and you’ve found the Truth! This in-between generation is perhaps busy climbing the corporate ladder - not all of them - a lot of them, younger than you, but not as young as the youngest ones, the Crystals. "Their contemporaries, beings of their lifetimes - you realize that those who are in their forty-somethings don’t even remember JFK, for instance, who was a Light of Love. And so how can they possibly have familiarity of, and remember, World War II, World War I, the creatures from Jeckyl Island, and so on. They don’t. They can read about it, they can hear about it, they can watch movies and youtubies, and all of those kinds of things, but they don’t have it in their own personal experiences of this lifetime! "And so to really bring home the Truth, so to speak, which is the forerunner of the Homecoming for all who choose to take up Lifestyles in the Higher Dimensions, it is so important that the Truth of 9-11 come out!!! And it is. We assure you it is. It is already out there for so many. It is perhaps the people of the United States of America, and Canada, who are least in the know of this particular Truth. Because when this unravels - all of the lies and deceptions that have been perpetrated against the people in regard to this heinous event - it will make clear all of the other Truths, going back 26,000 and some years, if you will, or perhaps to the 1800’s when the Illuminati, the Bankers, set forth their goals, and so on!!! "Pick a time - there isn’t a time in your history/herstory where there hasn’t been some influence by this group. They had help, of course, and that help is gone - pretty well gone - they still have some strongholds - but they are not strong anymore! That’s the Truth! They may think they are - a few of them are still delusional, but not many of them. They are starting to understand! "And what they are doing is - because they are so much in fear -they are wanting you to be in fear and so there is all this talk about Assad did this chemical bombing of his own people. He did not, and you know it - you already heard it from Beloved Tara and Rama,*** and we’re telling you again. Remember who did it, it was a black op operation carried out by the most elite of the black operatives - the same ones who carried out 9-11. They weren’t the planners or the initiators, but they carried it out -different folks perhaps, a different group of operatives, but nevertheless, the same organizations. "Remember, 'Al Qaeda' started out as a CIA file. We won’t say any more about that other than to say, as always, that they are to be forgiven and welcomed to the Light - all of those who would come! But we are only wanting to illustrate to you why it is so important that the Truth come out. The Truth shall make you free! How can you have Peace in your own Hearts when you know that the lies and the deceptions are still out there, or worse yet, still continuing - well, there won’t be much continuance!!! "Do you remember, and we are talking about gamesmanship here, and gameswomanship, because there are the dark hats and the white hats - and some are pretending to be dark hats and some are pretending to be white hats - but do you remember the chess board in Harry Potter? With real live beings? Well, we’ve got multi-Dimensional chess going on here, and of course, the lowest rung, or the lowest level on the chess board is the 3D, and then it goes up and up and up. And as it goes up, and up and up more and more, the chess board is populated by the white hats. So you get up to the very top levels and there are no more sides anymore - the chess board is just full of wondrous beings of light, hugging, and dancing and singing, because the dark days are over!!! "That is the Truth in this now moment. Our Mission is to bring this reality, to anchor it in place. And so it is that we talk about Freedom, we talk about Truth, and those are absolutely necessary components. Let’s put it this way: If the dark hats of the United States of America are still in charge of one of your alphabet agencies, which we shall not name, but the first initial is 'I' and the last one is 'S,' and there is one in the middle – if they are still in charge of that, how can you possibly enjoy your Abundance when you know that they are reaching out to take it all away from you? It makes no sense to receive it if they still have any sort of power, but their power is fast fading! "Sounds kind of improbable, doesn’t it? But if you go back and put yourselves into 1814 or so, when this treaty was signed - we are not big on dates here as you know - when the treaty was signed the Unites States of America had had its capital city burned, and had been invaded by England, so that makes it rather easy to understand, does it not? "History/herstory is fascinating - don’t get wrapped up in it, don’t think that’s the way it always has to be, and do not be in judgment of any participants, because, guess what? Most of you were there at some time or other, and you’ve worn a dark hat at one time or other. Why? So you could experience it, so you could understand it, so you could come to this now moment and forgive it. That is what we are here to do! "How can you have Peace in your own Hearts, Beloved Ones, if you are angry, if you are carrying any kind of a grudge or a judgment? How can you have Peace throughout your World, for all of Planet Earth, if you don’t each have Peace in your own Hearts?!!! So here we are together on the Bridge of The New Jerusalem. We have our circle well formed. We welcome all of you, and we are so excited and delighted that you have come! The Lights that you are shining right now are so beautiful and brilliant!!! "We are in awe of you, and we say to you - and all of those who have spoken or who are about to speak**** - that without you, we could not be facilitating your Freedom, your Abundance, and your Peace on Earth, much less our arrival with our technologies, which will free you in so many ways - free energy, and your own, we shall say, 'George Jetson' type of shuttle craft - so that we can make it real for you - and so many, many simplifications so that you can be free to follow your passions, so that you can receive your Abundance and do as you wish with it! And yes, we know that when this group of beautiful, beautiful beings receives, you already have plans for sharing it - it’s not necessarily a requirement for most of you, but it is beautiful! It is your caring and sharing that are going to bring the realities of the Golden Age Lifestyles that much quicker to the totality of Planet Earth. "It is your willingness to accept and share; it is your willingness to help bring about the cleansings, the clearings, the detoxings, and the replicators, the 'George Jetson' vehicles, and if you want it in red, like a little red sports car, it is perfectly all right - that’s Mother Sekhmet’s vehicle of choice - and so on, and so on! As you rise up into Higher Dimensions you won’t have any disabilities! As you achieve your higher levels of living within your physicalities, your physicalities are going to just absolutely bloom with health, rejuvenation, opening of your DNA, with your wisdom eyes wide open to receive, and your telepathic capabilities and all of your gifts – that’s what we mean when we say blooming and blossoming!!! "Much different lifestyles from what you look out upon Planet Earth and observe in this moment, but it is already in place. It is only to claim it!!! And thanks to you, we shall say this about President Obama’s speech - he heard you! He is listening with all of his capabilities and he is a multi-Dimensional being already. He walks with the Ascended Ones­– KOS is with him, St. Germain, Sananda is with him, as you know, and so many others!!! "He receives regular counseling, shall we say, and he shares his wisdom and his questions in these counsels, and he says everything that he can possibly say to show who he really is. But he is the absolute, quintessential chess player and he is moving the players around the chess board - figuratively speaking, but on some levels it is true! He is playing the games that must be played in order to bring about the checkmate once and for all of the dark hats, the thirteen families, the illuminati, the black pope, everybody who has ever wanted to control Planet Earth out of greed or any other fear-based basis!!! "What they need to understand is that they are being welcomed to the Light, and some of them have come and more of them will come, but we are getting down to the wire, so to speak. There are very few moves left that need to be made, and that is the Grand News for you, Beloved Ones, because you have spoken!!! "Obama, and we, are listening, so let’s keep our channels open and stay tuned to each other, because together, the finish line is in sight! Now is the time more than ever to let your voices be heard in a multi-Dimensional way!!! We shall momentarily be speaking from the Highest Levels that we can possibly rise to together, and that’s very, very high. "Because, Beloved Ones, You Are the New Majority! So we congratulate you and we thank you. Now let’s stand together and continue with this call this evening - or morning, as the case might be - and let us join together in bringing an even Higher Level of Peace and all that Peace requires, in order to be real and lasting for Planet Earth - and the Universe beyond is listening as well! "Mother/Father God thanks you! 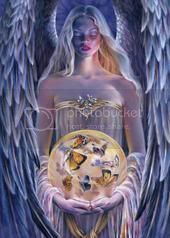 All of the Ascended Masters and the Angels, Mother Gaia and all of her kingdoms, stand and bow to you because you have succeeded! You Are the Majority and You Are the Voices of the Light of Love, and we love you beyond all words!!! And so it is. Salut!" * Ashtar was introduced by his chosen theme song, Come The New Jerusalem. ** The Course in Miracles. The Foundation for Inner Peace, 1975. *** The A&A Report from this call will be published when its transcription is complete. The time frame from June 10 – July 13, is extremely important for inter-development, inter worlds, inter research, inter- working. Changes, we are so tired of the word ‘shifts’ and well, but it is shifts in a way. Not actually shifts, it is ‘jolts’. You understand how an earthquake comes and just goes blohoooosh, and everything is changed? That is the earthquake period time for each individual human. All humans will have it. All humans will get it to a certain degree of acceptance. Even the family units are going to have drastic earthquakes changes and experiences. They may not all be good. They may be something that would be so drastic that they look at their life path they have chosen for now and see where and when they are going to make changes and how that change is going to be and in what direction. Some of it may not be pretty. Try to remove yourself from it all emotionally. Each time you respond to them (other humans/friends) or talk to them or communicate with them or energetically think of them, bring out energies through first. We are as, Tyre energy, of course, very tied to Egypt. It is the land that we all came from to begin with for the earth’s developed times. We want to continue having people come to Egypt because Ra, Isis and Akhenaton have all requested of this vehicle to bring their people home, which is how everybody on the planet virtually now. We have to continue sending healing, clearing vibration to the Governments of Egypt, to the people of Egypt that are being downtrodden and so controlled that the more blessings and love and creative thoughts sent to the planet and to Egypt (of course you know everything is to start there), so focus your thoughts, love, compassion and your healing and your ‘ripping off the fakeness’ to be revealed for truths. Focus it all there, please for now. They need it. It is of vital importance. And call out to other light workers and get them to join. Send the call out over and over and over where it doesn't ever stop. Focus the love and the truth to the land for Egypt and for the people that are occupying the space for Egypt. It will flow from Egypt through the nearing towns and countries and cities. It will go through Africa. It will go through all of Asia – it will go. But it has to start in Egypt you see; because this is where every one of you started. The healing has to start where the festering wound first started. You can’t put a Band-Aid over the symptom of a problem in the body someplace not even related close to where the initial problem is now can you? Basically – the illness, the festering wound of humanity started in Egypt. If the medicine, the energy, love, the vibration, the healing thought, loving thoughts, do not go to where the festering wound started, if it goes’ over to another far tributary to the east or the west or the north or the south, it’s the same as putting a Band-Aid over a cut finger when you have a toothache. Now do you understand? So that is what I’m trying to say as Grandmother to Tutankhamen, who was a dear love (when he was younger - -there were a few issues when he got older (she chuckled)– but he always felt his heart was in the right place). Don’t negate your powerful, positive thinking with self doubt coming from your mouth. What you think that feels good and feels right let that breathe out. Instead of thinking something feels good and right and breathing out something that is going to completely negate it. This is the same we want you to do with the healing for Egypt for the festering of the beginning of the wound. Think good feeling, wonderful ways of love, and healing and light and bright and truths and correctness coming through all that is there. And then when you speak, don’t speak with the ones that are saying, ‘oh that’s so terrible’. Speak with ‘but it’s going to change. It is in the process of being corrected now. I have so much love and compassion for our brothers and sisters there who are on the forefront. They are the army, they are the lines, and they are the first ones into battle. They are the ones forging the way.’ Now do you see? (King Tut’s Grandmother and wife of Amenhotep III) She pronounced is as Tyre even with no “r” in the spelling. Her energy is a blend of the grandmother image of King Tut, of the mer people (mermaid type), and an amazing star being of light. She is all of those combined and at times one or more energetic vibrations moves to the forefront for what is required for a particular situation.